Multi-Vendor User Account: With the help of this Marketplace add-on, the sellers can manage their own sub-accounts. The sellers can set access permissions for these sub-accounts by giving them access to some specific features of their web store. This helps the sellers to divide their roles and responsibilities with the other sub-account holders. Multi-Vendor User Account: With the help of this Marketplace add-on, the sellers can manage their own sub-accounts. The sellers can set access permissions for these sub-accounts by giving them access to some specific features of their web store. This helps the sellers to divide their roles and responsibilities with the other sub-account holders. For eg: A seller can add agents/users to view orders and products only while other users can manage the orders. Please Note - Multi-Vendor User Account is a Marketplace Add-on. You need to install Webkul Magento 2 Marketplace Module first. Admin/seller can create/add sub account. Both, the admin and the seller can assign specific roles to the sub-account holders. Sub account users can access only assigned functionalities by the admin/seller. Allow the sub-account holders to perform the actions on the web store according to their defined roles. Sub-account is used when the vendors themselves are unable to manage their products, order, etc. and wants to create users with restricted access who can handle their account and manage their respective tasks. This way the sellers can distribute their jobs and duties to their sub-account users. This Module allows the sellers to manage and complete the web store tasks by the multiple sub account users. Thus, reducing the store management time. Multi-Vendor User Account allows sellers to create multiple sub-accounts for themselves. 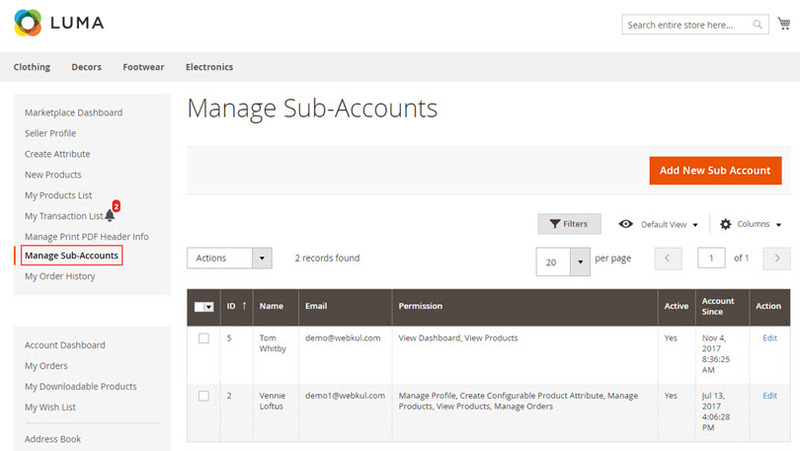 These sub-account users can have various permissions such as - view orders, manage orders, view products, manage products, etc. Enable/disable the marketplace sub-accounts functionality. Show/hide the Manage Sub-Accounts menu option for the sellers. Allows sellers to add and edit their own sub-accounts. 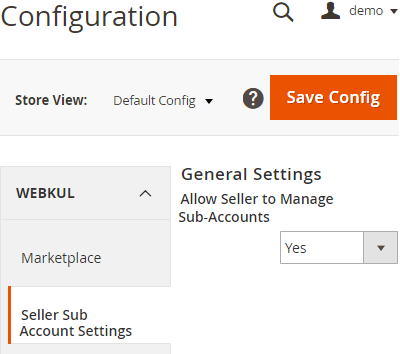 Allow sellers to set access permissions for their sub-accounts. View list of all the sub-account users with details. Edit the sub-account user details such as - first name, last name, and email. Select and modify allowed permissions for each sub-account user. Change sub-account active status - yes or no. Use filter option to search any sub-account user from the list. View sub-account activation date & time. The sub-account users can perform various web store functionalities for the sellers such as managing orders, products, profile, order PDF information and so on. The admin or the sellers can create multiple numbers of sub-account users who can manage the web store efficiently. They can do various web store activities as per the allowed permissions assigned to them. The sub-account users receive an email for setting the password. In the email, the sub-account users can view the list of allowed permissions. When logged in to their accounts, separate My Account menu options are available. The sub-account users can do the various web-store tasks as per the assigned permissions. When a new sub-account is created it becomes the customer of the store. 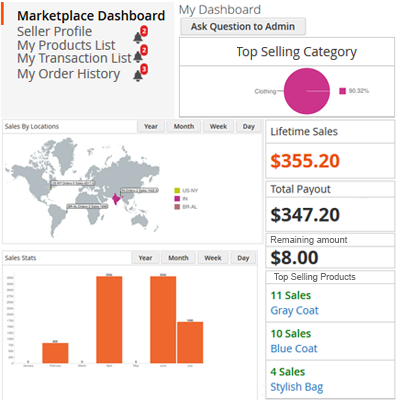 View Dashboard - view sales statistics, ask a question to admin, latest orders, and reviews. Manage Seller Profile - Edit seller information. Manage Products - Add product or edit or delete products. View Products - View sold quantity, stock, revenue earned. Manage Transactions - View seller payment transactions. Manage Order PDF header information – Edit or change the order pdf header details like name and address. Manage Orders - Complete management of orders. Create shipment, invoice, credit memo or cancel an order. My Customer List - List of all the customers of the seller. My Review List - Viewing seller reviews. Add new sub-account user for the seller. Edit sub-account user information like first name, last name, and email address. 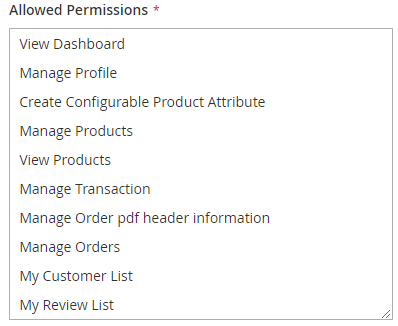 Select the allowed account permissions - view orders, manage orders, view product, manage products, etc. Change sub-account active status to yes or no. Delete the existing sub-accounts users of the sellers. All customers are classified under group as - general or sub-account. The admin has complete control over the seller sub-accounts. When a new sub-account user is created, it is automatically added to the existing customer list. The sub-account user can do all the customer activities like a normal customer. This allows the admin to view and manage the customer, sellers, and sub-account users easily. View the sub-accounts list of the customer. Edit the sub-account details of the customer. Search sub-account users from the list. Did you buy Marketplace Multi Vendor User Account For Magento 2? Q1-What roles and permissions can be given to seller sub accounts? A1- The seller can grant multiple permissions to the sub accounts to access the functionalities of the web store. These are manage orders, view products, manage products, view dashboard, manage profile, create configurable product attribute, view transaction, manage order pdf header information, view customer list, and view seller reviews. Q2- How many sub accounts can be created? A2- The sellers can create as many as sub accounts as per their requirement. There is no limit for sub-account creation. Q3- What happened when a sub-account is deleted? A3- When a sub account is deleted from the sub account grid, all the assigned web store permissions gets disabled for that sub account. But the data of that sub account still exist in the Magento 2 database. To delete the data also, the admin needs to delete the sub account from the customers list as well. Q4- Does it work with multi store and store views? A4- Yes, this module works with the multi stores and store views. Q5- Can a sub account user manage all the orders of a seller? 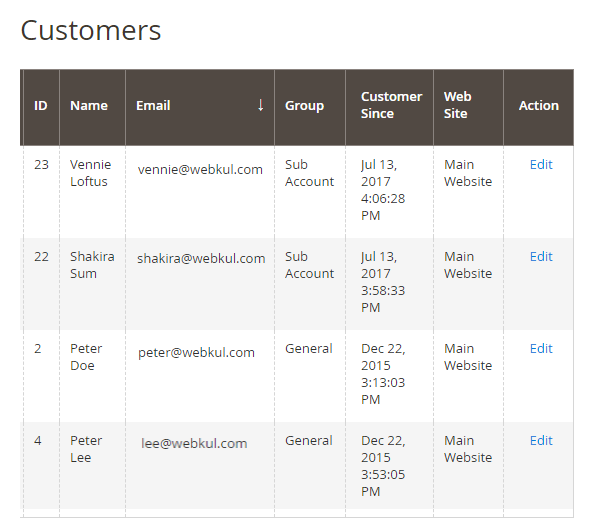 A5- The sub account users can view and manage the orders of the sellers. When the seller grants the store permission “Manage Orders” to the sub account, this enables the sub account user to - create an invoice, shipment, send email, and cancel the order. + Compatible with Marketplace version 2.1.5 or greater version. + Compatible with Marketplace 2.1.x. + Compatible with Magento 2.2.0. + Allow sellers to add sub accounts to manage their accounts. + Allow seller to provide account permissions to sub accounts to manage seller's accounts. + Allow admin to manage seller's sub accounts.